One of my favorite ways to spend a Saturday morning is to head out for a little thrift store shopping. This weekend I decided to check out The Goodwill. When I go to a thrift store, I like to go with a clear mind and plenty of time to look through the racks. That's why a Saturday morning is the perfect time of the week to go. On this particular shopping trip, I really enjoyed searching through the clothes racks. Thrift store shopping can be so much fun hunting out those great bargain prices. The best part is, on top of the already low prices, there is always a sale. Today it was 50% off green and purple tags. I've set a budget for myself when it comes to thrift store shopping. $10 is my max, so I try to stretch it out as much as I can. 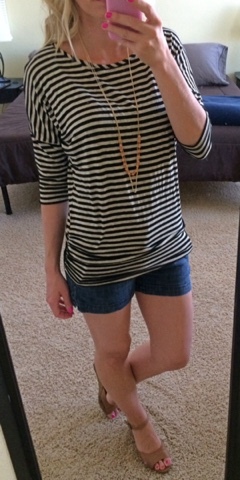 I ended up finding an entire outfit for $9! !